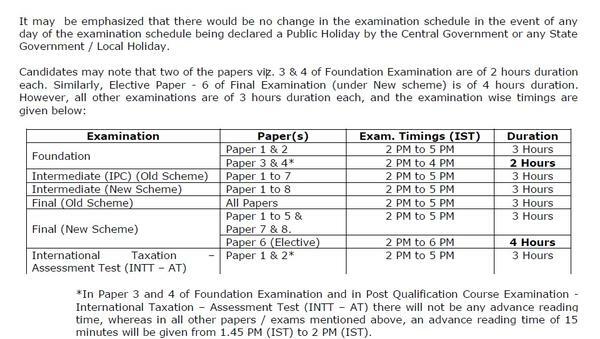 The Institute of Chartered Accountants of India (ICAI) has released the CA IPCC Exam Date 2019. 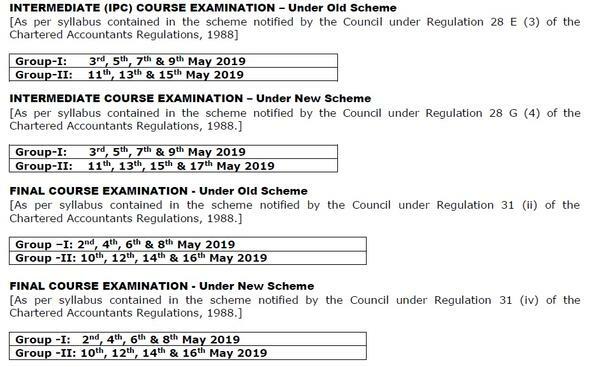 The date for the ICAI CA IPCC May 2019 Group I (Old and New Scheme) exam will be conducted on 03, 05, 07, 09, May 2019 and Group II (Old and New Scheme) exam has been scheduled on 11, 13, 15, May 2019. Those who want to appear in the ICAI CA IPCC examination have to make an online registration by filling an application form. The application form for the ICAI CA IPCC May 2019 exam will be available at the official website of the Institute from 20 February 2019. The last date to submit CA IPCC May Application Form is 12 March 2019. Candidates are suggested to do CA IPCC Online Registration within a given period of time. For more details, check below information. Go to the student's section available at the top menu bar. Now a drop-down list will appear now you have to press the “Course Registration Forms” link. On the next page select for CA IPCC course link. Candidates have to log in their Email id registered with this portal and password. Candidates who are new have to hit on the “New User Registration “link and register themselves by provided complete details. Fill the CA IPCC Exam Application Form. Upload your scanned copy of passport size photograph and other required documents. Finally, submit the form and take a print of submitted application form.